Nihari is a popular meat stew in Pakistan, Bangladesh and parts of India. 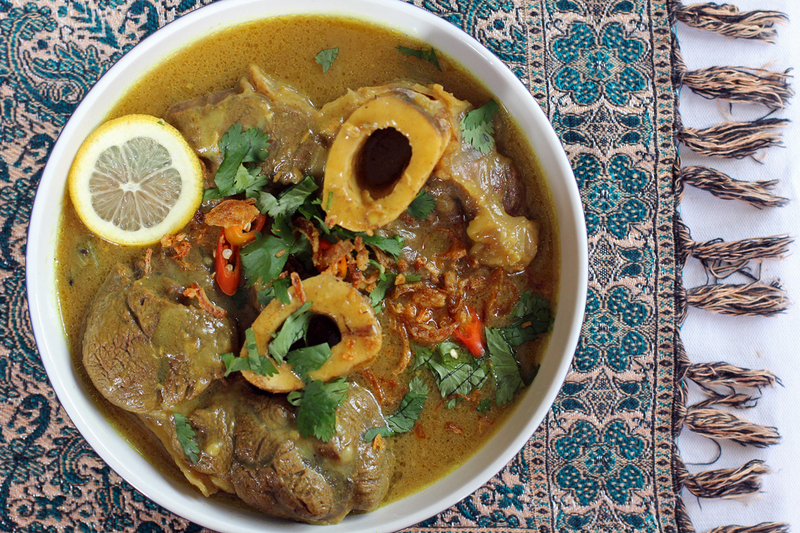 It is made out of beef shanks (sometimes chicken and vegetables) slowly simmered in an array of spices. Traditionally nihari is cooked overnight and sometimes it is even buried underground while it cooked which makes the meat really tender, other versions also use brains to enhance and thicken the texture of the stew. Once served it is garnished with coriander, crispy fried onions, green chillies, ginger, lemons and white radishes. The name Nihar came from the Arabic word “Nahar” which means “morning”, hence the reason why this dish is usually consumed in the early morning before sunrise, right after the Fajr prayers. For my recipe we will lighten it up a bit compared to the traditional one and we will be cutting down the cooking time of course, we won’t be consuming this in the morning as well but I should try that even just for once in the near future I guess most guys would want something savoury for breakfast. In a large pot add oil then beef shanks on all sides, remove from pot then set aside. Add the ginger, garlic and onions and stir fry until onions are soft. Add the cayenne, turmeric and coriander, continue to stir until fragrant. Add the beef back and the remaining ingredients except for flour and fill with water until beef is totally submerged. Bring it to a boil and simmer in very low heat for 2 hours or until meat is very tender. Add water if needed. Remove cinnamon stick, star anise and bay leaf, dissolve flour in 1 cup of water then pour into the pot. Simmer for 15 more minutes and let the sauce thicken. I have been craving flavorful curries and stews so this sounds perfect. Oh, what fun! Something bar osso buco to prepare with shank pieces! Not that I dislke the first [one of ‘my’ dishes’!] but this will be so much pleasure to prepare and taste – and i can imagine the depth of flavour! Sorry, your very first step in your method, do you mean to say “brown the shanks on all sides” or just to coat the brown shanks in a pot of oil. Sorry, it could be interpreted either way. Also if you do brown the shanks at what temperature on the stove low, med, high? Thank you so much! My apologies for the confusion, what I meant by browning is to sear the meats surface in high heat in doing so it adds a lot of depth in flavour. In the Azores (Portuguese islands) it is still used to cook underground due to volcanic geysers. Really like the spice and flavor profile of this dish and slow roasted meats are always so comforting on cold days so this is just the right season for this dish. This sounds DELICIOUS! I look forward to trying it. This is one of my favorite dishes 🙂 My family is from India and we make this on special occasions! This looks so savory and warming. I don’t think I’ve eaten anything quite like this before. Anything with curry gets my attention! I love the stuff. This looks wonderful – so good. Thanks. Wow that spice list is impressive! I’d love to adapt this for a crockpot and give it a shot.